Cuts plate 12 feet long x 5 feet wide x 8 inches thick 36″ throat capacity. This systems consists of three (3) hydraulically actuated rear clamps that does not release the plate during cutting or indexing. This feature insures the accuracy of repetitive cuts. 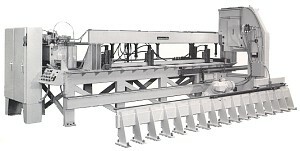 The saw can be programmed to make up to 99 cuts of various widths. Saw will cut continually while the programmed number of cuts is being fulfilled. Also included is an interrupt option that permits a special cut to be made, and the saw automatically returns to the pre programmed cutting sequence. This programmable feature allows the saw the cut on its own without operator attendance. WHEELS: Two 36″ diameter super rigid all steel wheel with heavy dutyshafts and bearings. GUIDES: All steel Tannewitz guides with carbide jaws. (1) Upper, (1) lower Hydraulically operated with column mounted controls, automatically maintains proper blade tension.